Strap in for the ride of your life and death! A terrifying tribute and modern twist on classic bloody slasher fun, HELL FEST is the perfect treat for anyone who doesn’t want Halloween to end. Directed by Gregory Plotkin (Paranormal Activity: The Ghost Dimension), HELL FEST stars Amy Forsyth (Rise), Bex Taylor-Klaus (The Last Witch Hunter), Reign Edwards (MacGyver), Christian James (Nashville), Matt Mercurio (American Made, The Leisure Seeker), Tony Todd (Final Destination), Roby Attal (Bodies of Water). In this terrifying thrill ride, college student Natalie is visiting her childhood best friend Brooke and her roommate Taylor. If it was any other time of year, these three and their boyfriends might be heading to a concert or bar, but it is Halloween, which means that like everyone else they will be bound for Hell Fest – a sprawling labyrinth of rides, games and mazes that travels the country and happens to be in town. Every year, thousands follow Hell Fest to experience fear at the ghoulish carnival of nightmares. But for one visitor, Hell Fest is not the attraction – it is a hunting ground. An opportunity to slay in plain view of a gawking audience, too caught up in the terrifyingly fun atmosphere to recognise the horrific reality playing out before their eyes. As the body count and frenzied excitement of the crowds continue to rise, he turns his masked gaze to Natalie, Brooke, Taylor and their boyfriends who will fight to survive the night. Paying homage to our favourite slasher films of the ‘80s, HELL FEST is an exhilarating fever pitch of bloody chaos, played out across a lush neon playground where danger, and the next gruesome (and surprisingly inventive) kill, waits around every corner. 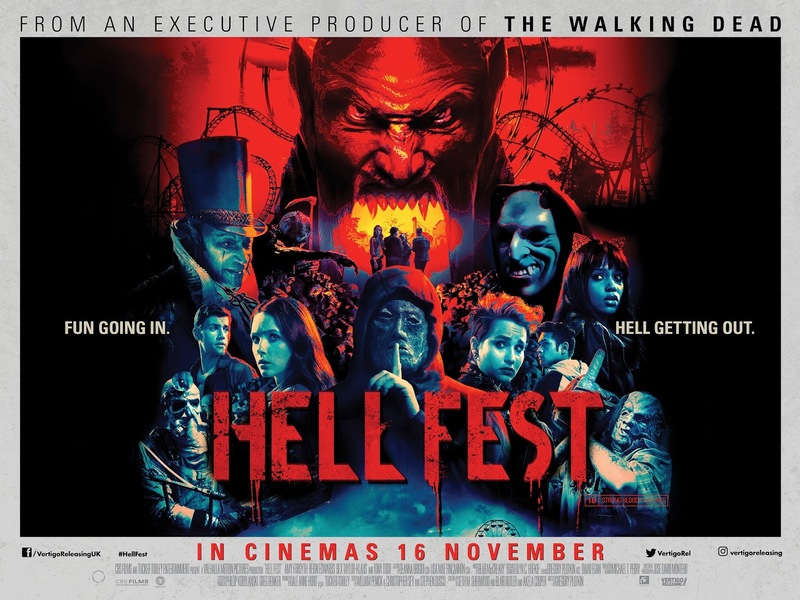 If you still have some screams in your system after this Halloween come see HELL FEST which comes to UK cinemas 16th November 2018 from Vertigo Releasing, there’s no season pass required for entry into HELL FEST, which is sure to leave a twisted smile on your face!